Good evening and welcome to the 79th blog issue of the Airport CEO development blog. This time we’re posting a little earlier than normal and will continue to do so since it’s just way better for ones health not to stay up late and writing blogs at 4AM. Speaking of that health, let’s skip the chitchat and get straight to it! We have now submitted a build for Steam to approve. This is the last step in the Steam release train, at least from Steam’s verification process perspective and it is of course a major hurdle to overcome. If the build is approved, we will have complete control over the release procedure from that point on. However, regardless of wether the build is approved or not we still have internal test programs running that we need to complete before the initial release and until those are finished we will not be announcing any details on the exacts of the launch. We still very much plan to release within August 2017. The Airport CEO Steam Community has taken off pretty well and is filled with future CEO’s discussing various details on the title. Make sure to head over there and join the group as well as putting the title on your wish list! Due to popular request from the forum we have decided to reiterate on the design of the flight allocation process. Previously flights were assigned stands automatically at random (well, not random, a sophisticated algorithm) but it seems as if you all though that was a bit too basic. From a coding perspective it worked very well since the game engine, essentially us, were in control and could make decisions that we ourselves knew the frame of but from a gameplay perspective it didn’t seem as fun. We get that, it’s obvious that the more control the player has the more their decisions take expression in the world they control and in a game that’s all about control; that’s a good thing. The challenge is that when we let you in on managing one of the core aspects of the game we also let in an unpredictable variable. How should we handle a player’s rescheduling of a flight? To what extent, in terms of time, can the player be allowed to reschedule a flight and to what stand? What is the best way to implement passengers adapting to a sudden gate change? What should happen if a player wants to remove a stand that has several scheduled flights on it? So what we’ve done is to rip that previous piece of stand assigning code apart and are instead enforcing it on the player via the UI which means that we still control the extremities of to which extent a possible stand rescheduling is possible while also allowing the player to set their individual flight schedule. In other news we have mostly been working hard on our feature and bug backlog. 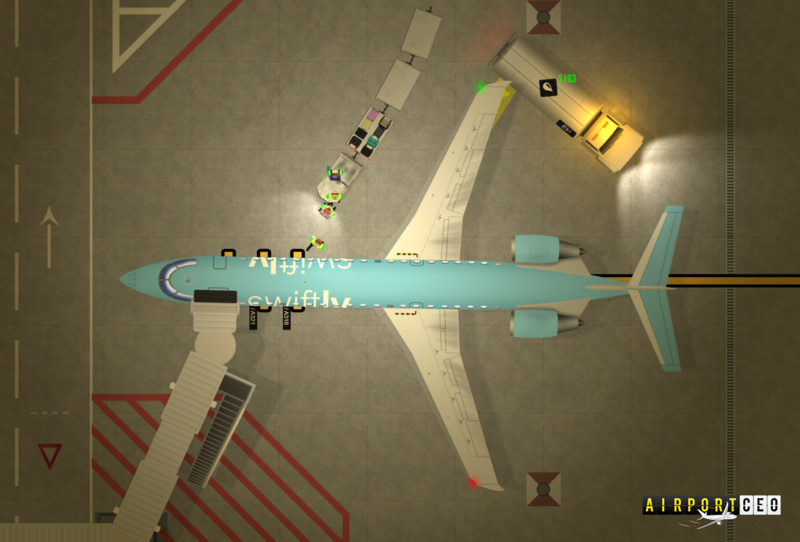 Swiftly is now fully implemented and operating the skies (ignore the acrobatic ramp agents). 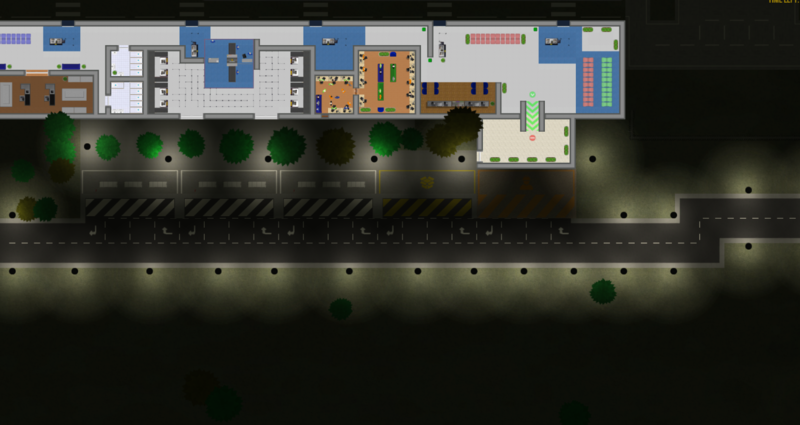 We’ve also finally implemented street lights! No more darkness outside. On this screen the tops of the lamps look like black dots but we have since then mildly tweaked those to look better. Also the lighting effect itself will most likely see some revisits over time. Let there be light! And now, let there be and end to this development blog. Until next time, fly safe!